This season has come and past so fast, I can barely believe it. I feel like over the past 12 weeks we haven’t really gotten much resolved when it comes to the new questions raised throughout this season, nor any of the lingering ones from season 1. For instance, when the hell is Eren going to get to his basement? To think that we’ve gotten through an entire, brand new season and yet not once was it even acknowledged. Not to mention that last season’s season finale made it seem as though it would be a HUGE plot point going forward. Overall, although it’s not exactly the season finale I would have hoped for, ‘Scream’ was most definitely interesting. At the beginning of the episode, we flashback to a memory of Eren’s mother, leading to her untimely death while escaping with Hannes, Mikasa, and Armin as their district within Wall Maria is overrun by Titans. Coming back to his present situation, Eren and Mikasa are confronted by the same Cheshire grin Titan that had killed his mother. His eyes widen in horror as the very Titan that ruined his life is before him now. To be honest, I’ve never really thought of this as a possibility due to the sheer number of Titans that we’ve seen on the show to date. It is interesting to get to see how Eren, now armed with Titan powers, handles this chance reoccurance. Erwin escapes on his horse, still missing his right arm from last week’s Titan attack. He narrowly escapes another tossed Titan from Reiner who is dealing with his own issues with Bertholdt and the large horse of Titans brought on by Erwin. The Titan that was flung over now in pursuit of him as he begins to ride again. Luckily, Ymir in Titan form, is nearby. She blames Erwin for the botched escape but still fends off the Titan that’s chasing Erwin. Due to the force from Ymir stopping his pursuer, Erwin is knocked off of his horse and thrown quite some distance. A nearby soldier runs over to assist Erwin. Hunched over with eyes on the ground, Erwin tells the soldier that saving Eren takes priority over saving his life. Looking up for a response, he finds the assisting soldier is already in the mouth of one of the surrounding Titans. Mikasa, injured during the events of last week’s stands to protect Eren from an impending attack, but it is Hannes who comes in to save them both. He tells them that is he going to avenge Eren’s mother and “butcher the s***” out of the Titan. After this heroic entrance, he takes off to begin his assault on the smiling Titan. Jean and Armin try to close the distance between themselves and Hannes, but are cut off by another Titan tossed by Reiner. Done dispatching another Titan, Ymir in Titan form regroups with Christa, Conny, and Sasha. Ymir begins to contemplate about what her next course of action is after Reiner and Bertholdt are seemingly not going to be able to keep Christa or herself safe. Christa lands on top of Ymir’s head as they get close. When Conny calls out to Christa, she stops him and acknowledges the fact that her real name is Historia and will go by here real name from now on. Historia (Christa) tells Ymir that from now on they will only live for themselves instead of others. Approaching another roaming Titan, Christa leaps from the top of Ymir to begin fighting another wave. As Mikasa struggles to stand and assist Hannes, Eren calls for her to untie him. He tells her that it has to be him that takes down the Titan in order to gain closure. She complies and frees him. Ready for battle Eren stands and declares that it’s time for payback, biting on his hand to transform. To his surprise he isn’t able to, having not fully healed from having his arms removed by Reiner. He continues to gnaw at his hand hoping to trigger his transformation which is, even by anime standards still SERIOUSLY brutal. 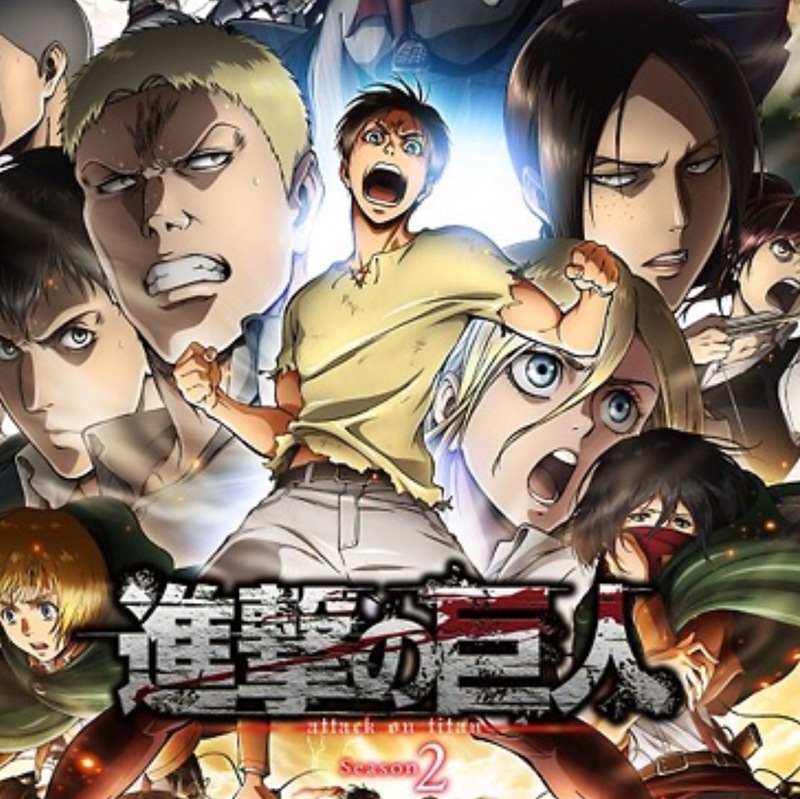 In the center of a group of soldiers fighting to protect him, Erwin is warned that the Armored Titan is coming. Still escaping the flying Titans, one lands directly in front of Jean, knocking him back off of his horse and onto the ground. Armin leaps from his horse to help Jean who he finds incapacitated. 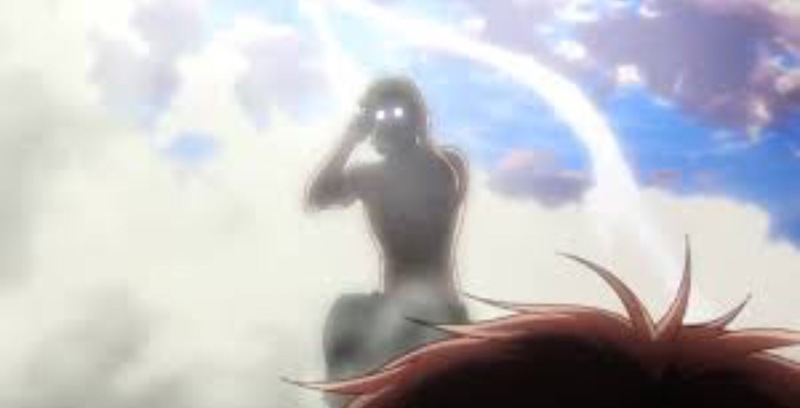 The recently thrown Titan stands, Armin and Jean in it’s sights. With Hannes still holding his own against the Titan, Eren desperately continues to try and activate his powers. His friends and comrades all around him are in desperate situations, fueling Eren to do whatever it takes to try and call out his Titan form. Hannes manages to get a strike to the Titan’s Achilles Tendon, bringing the smiling Titan to it’s knees. Just as he’s brought down, the Smiling Titan snatches Hannes from the air. Watching on, Eren persists in trying to transform and save his friends. In his mind he thinks that that if he can’t transform now, then this entire rescue was for nothing. He continues to viciously chew at his hand, hoping that he’ll be able to fight off the Titan in time. Hannes makes eye contact with Eren as the smiling Titan bites off his legs. While the Titan finishes what’s left of his friend, Eren bursts into hysterical laughter. He stops laughing to tell himself that nothing’s changed, trying to convince himself that he is still the same boy that was helpless in saving his mother years ago. 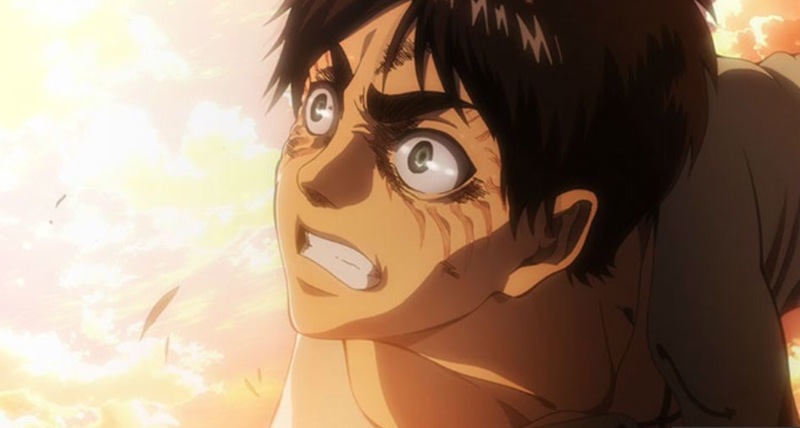 As the laughter turns to crying, Eren calls out for his mother. He says that he still can’t do anything. While all of this chaos takes place around them, Mikasa tells him that he has saved her life in more ways than one. She tells him that he is the one who showed her how to live with a purpose, that he was the one that wrapped the scarf around her. 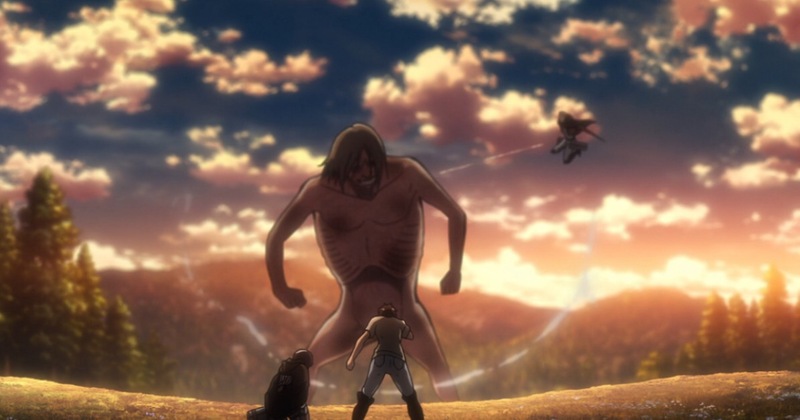 Inspire and fully healed, Eren lashes out at the Titan, triggering a power that he didn’t have before. This new power seems to grant him control of the will of the Titans. His intent to kill the Titan prompts all of the nearby, non-unique titans to attack the smiling Titan. The soldiers look on in disbelief as their lives are spared. Eren, with Mikasa on his back tries to get away, both still puzzled as to why the Titans stopped what they were doing to attack one of their own. Their escape is short lived as Reiner charges in their direction with Bertholdt still on his shoulder. After learning that the name of Eren’s power is ‘The Coordinate’, we don’t get much more information about the full extent of his abilities. Fed up with being chased, Eren screams out for them to get away from him. He threatens to kill them, unknowingly commanding the Titans that were still ripping apart the Smiling Titan to go after Reiner and Bertholdt. Realizing that this was there opportunity to escape, Commander Erwin orders a full retreat. While what’s left of the rescue party retreats, Ymir pulls off, looking back at Reiner and Bertholdt struggle against the horde. Historia stops next to Ymir, questioning what was wrong. With full understanding of why Reiner and Bertholdt needed Eren so badly, Ymir has come to see that humanity still has a chance at survival. Ymir says that she is sorry, and then heads off to go aide Bertholdt and Reiner in fighting off the attacking Titans. Riding off, Eren has a memory of being back in his home town with Mikasa, Armin, and Hannes. He is still shaken by his most recent loss, and being powerless to stop it. On top of one of the broken walls dividing the districts Ymir, Bertholdt and Reiner have survived. Curious, Bertholdt asks Ymir why she came back to help them. Amused by the question, Ymir replies that she is an idiot. She confesses that had it not been for them destroying the walls, “she would have never broken free of her nightmare” and that she will be their trophy so that they don’t go back empty handed. After some time passes we learn that due to reports circling about Wall Rose being breached, residents living within wall Rose have left to live in an underground city within Wall Sina. Conditions in this underground city are worsening as space and supplies become limited. In order to prevent people from turning on each other, authorities have declared it safe. Within District Trost, Hange and Conny go to visit Commander Erwin, Commander Pyxis and Levi with important information. They divulge their theory that the Titans that attacked Conny’s village were the village resident’s themselves. In disbelief and dissatisfied, Levi asks has be exherted all of his time and energy on killing humans? Hangs responds this there is no proof yet, but that this is a strong possibility. Eren, Armin, Mikasa, and Jean recount the events of that day. Armin tells Eren that he and Jean have been giving some serious thought as to what compelled the Titans to go after Reiner. He explains that the only conclusion that they could come to was that it was Eren that was controlling them. Jean steps in, telling Eren that a lot of lives have been lost at the cost of rescuing him and discovering this new power, and that he needs to do what is necessary to avenge the lives lost. While this whole season has had its ups and downs, as a whole Scream does a great job of setting up for the larger conflict awaiting in Season 3. While there is no real resolution, again, when it comes to questions left unanswered; I was still left wanting to know what happens next. Who is the man controlling the Beast Titan? Will Eren be able to wield this new power and turn the tide of this war for the survival of humanity? Luckily we won’t have to wait long for answers, as it was announced during its broadcast in Japan that the popular anime will be back for a 3rd season in 2018. I can’t wait to see how the events in this finale shape the landscape for the 3rd season. I hope that you guys enjoyed this review. If you want to discuss any memorable parts of the season or theories on what’s to come drop a comment below, and for any news surrounding the next season of Attack On Titan, stay tuned to 4GLU for any updates as they come in. Intense situations, a tragic loss, and a new power. Literally zero questions answered left lingering from the 1st season.